Creamy coconut lime chicken thighs - 30 minute, one pan meal that is perfect for meal preps or for a quick dinner! Dairy-free, gluten-free, and paleo-friendly. Do you ever get tired of cooking chicken the same way over and over again? As someone who is married to a man that works in the poultry industry BOTH of my hands are up! I would think even someone who develops new recipes every day can fall guilty to this routine. To get me out of this rut, I often turn to Thai cuisine. One of my favorite thai dishes is Tom Kha Gai soup. If you’ve had this traditional thai soup then you know the flavors of coconut and lime are at the forefront. I’ve taken those components of Tom Kha Gai soup and incorporated it with chicken. So, there you have it -- a delicious Thai-inspired chicken recipe that pairs well with cauliflower rice or sprouted brown basmati rice and broccoli for lunch or dinner! You may have noticed that the sauce color isn’t the prettiest but you shouldn’t be discouraged because we are focused on flavor over appearance. I’ve followed recipes similar to this one but they skip the best part which is thoroughly developing flavors in the cast iron. Don’t wipe away those brown bits after browning your chicken! That is the best part, I’m telling you! My husband describes this recipe perfectly - it’s reminiscent of a good southern meal but with flavors of something exotic. I think that’s a perfect description because I wanted to create a recipe that is wholesome and hearty but with more depth. You can bring these spicy, floral, and fragrant flavors to your table easily using curry powder, ginger, and cilantro. Heat 1 Tbsp oil in a cast iron skillet over medium high heat. While your pan is getting hot, generously season chicken thighs on both sides with salt, pepper, and yellow curry powder. Add the chicken thighs to the skillet and sear for 5-7 minutes. Remove the chicken from the skillet and set aside on a plate. The chicken doesn’t need to be fully cooked at this point - we will be returning it back to the skillet shortly. Turn the heat down to medium and add more oil to the pan. Add garlic to the pan and saute for 2-3 minutes. Add chopped peppers. Make sure to scrape the brown bits into the garlic and pepper mixture. Once peppers start to sweat, add coconut milk, salt, fresh ginger, and lime. Bring to a boil then add the arrowroot flour + water mixture. Once your mixture has thickened, place chicken thighs back into the pan. Cook for 10-15 minutes on medium heat or until your chicken thighs have reached an internal temperature of 165 degrees Fahrenheit. Garnish with cilantro, green onions, and lime. Serve over brown or cauliflower rice. If meal prepping for 4 servings, cook 4 servings of brown or cauliflower rice and one broccoli head. Some coconut milk brands can provide different consistencies. I prefer using Thai Kitchen. Feel free to spice up the recipe with chili oil or fresh chilies! 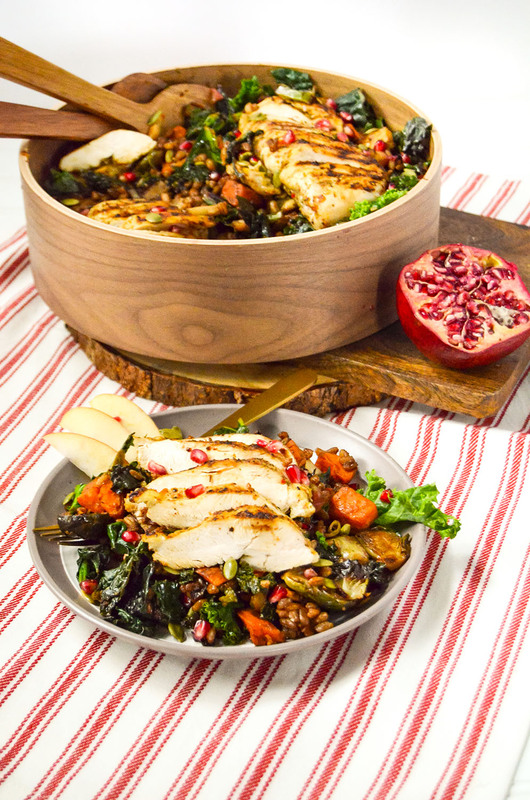 Fall Harvest Grain Bowl is that perfect main dish filled with the most favorite seasonal produce! I was inspired to make a harvest bowl after eating at a sweetgreen for the first time. My husband ordered their famous harvest bowl and absolutely fell in love with it. Now, this doesn’t happen too often where he will love something healthy, so I knew right then that I had to create a recipe similar so that he can continue to enjoy healthy foods like a harvest bowl. The grain that puts this dish together is farro. If you haven’t had farro then you are missing out! Farro has a brown rice / nutty taste with a nice, chewy texture. This ancient whole grain is also very healthy as it contains a hefty dose of vitamins A, E, and minerals like iron and magnesium. What’s great about farro is that the texture pairs perfectly with soups and main course salads like this fall harvest grain bowl! A new tip I learned recently from Nutrition Stripped is to massage kale. Not only will your kale last longer in the fridge, but your body will digest the kale more easily by physically breaking it down. You can read more in her post here for the nutrition/science break down. For this recipe, we will be massaging the kale with lemon, olive oil, and salt. Have fun with this recipe and swap out ingredients based on what your favorite fall produce are as well as preference. For example, if sweet potatoes are not your thing then use butternut squash instead! Preheat oven to 425 degrees. On a baking sheet, toss sweet potatoes and brussel sprouts with a little EVOO, S&P, and garlic powder. Cook for 15 minutes and then turn for an additional 10-15 minutes or until cooked through and crispy. While your sweet potatoes and brussel sprouts are cooking, de-stem the kale leaves from the stem by slicing out the center. In a large bowl, add the de-stemmed kale leaves, 1 Tbsp EVOO, squeeze of 1/2 lemon and a couple dashes of salt. Using a massaging action, start to tear the leaves apart and massage. Continue to massage until the kale leaves turn a more vibrant green. On medium-high heat, add diced apples to a large skillet with 1 tsp oil. Saute for about 2-5 minutes. Add the kale leaves along with the cooked sweet potatoes, brussel sprouts, and cooked farro. Mix together maple syrup and balsamic glaze and drizzle over the skillet mixture. Once the mixture is fully incorporated with the balsamic reduction, turn the skillet off and plate your harvest grain salad with grilled chicken (or other types of protein). 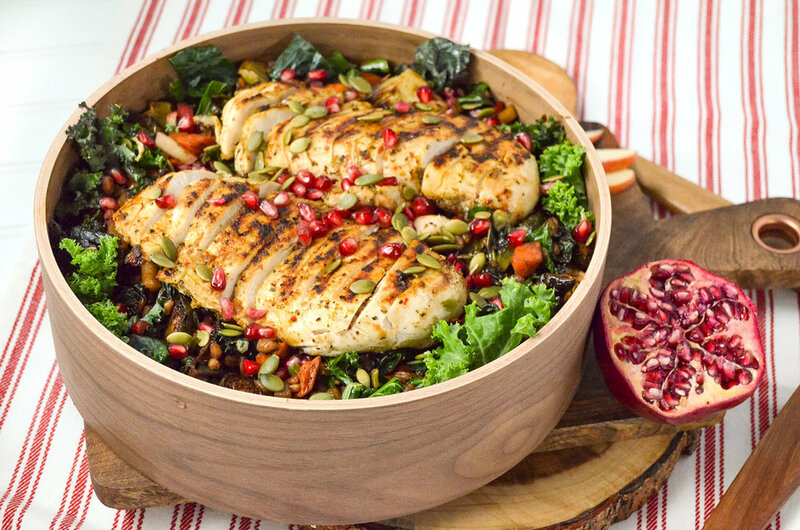 Top with pomegranate seeds and pepitas and enjoy! 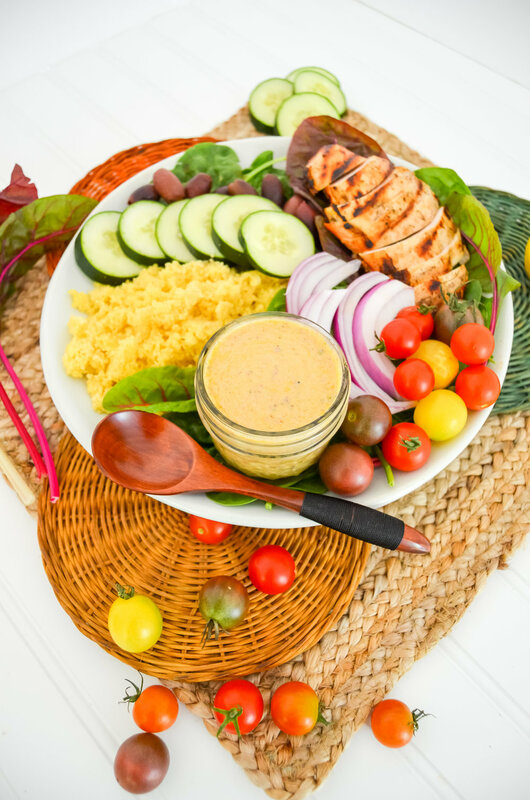 My healthy take on the classic chicken salad is loaded with nutrient dense fruits and veggies as well as healthy fats that will keep you full all day long without weighing you down! 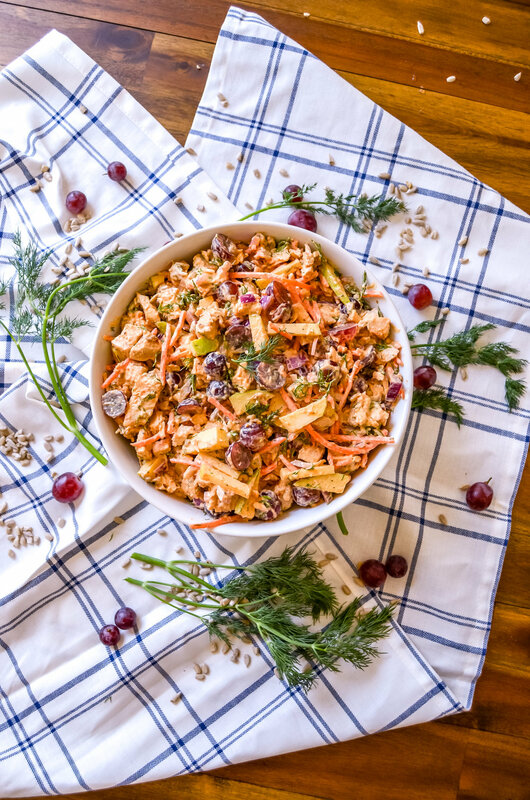 Make your busy life manageable with this quick and healthy classic chicken salad that is sure to fill you up and save you time and money!When I worked at a spa in West Georgia, I would grab lunch at Chicken Salad Chick and get their amazing chicken salad that was quick and super refreshing. Sometimes, I would indulge and get the not-so-healthy chicken salad options. Nonetheless, everything was amazing and I miss it dearly! Now that I live in Kentucky where unfortunately Chicken Salad Chicken does not exist, I make my own chicken salad at home, saving time and money. With this recipe, all is good in the world! My healthy take on the classic chicken salad is loaded with nutrient dense fruits and veggies as well as healthy fats that will keep you full all day long without weighing you down!There are many ways to prepare chicken salad, but for this recipe, I have found that red onions, carrots, granny smith apples, sunflower seeds, and grapes are the perfect classic combination. As far as seasonings go, I keep it simple but use fresh herbs like dill and smoked paprika which I believe separates my classic chicken salad from the rest! You can use whatever creamy component you prefer depending on your allergies/preferences. I have tested this recipe with avocados, vegan mayonnaise, and greek yogurt, so you are good on all fronts if you would like to change things up. Additionally, you can either shred the chicken or dice them. I prefer dicing as it saves a little bit of time and I appreciate the texture. Now, onto the recipe! This recipe makes 4-6 servings and is a good choice if you want to meal prep it for the week. I like to use chicken salad for sandwiches, pairing it with tomato slices, mixed greens, alfalfa sprouts, and pickles on 100% whole grain bread. You can also add it to a salad or even have it as a snack with crackers! Heat 1 Tbsp coconut oil in a skillet over medium-high heat. Prep chicken by seasoning with poultry and citrus seasoning and s&p. Grill chicken on both sides for about 3-5 minutes or until brown and completely cooked through. Remove chicken from skillet; let chicken rest and cool. Add the remainder of the ingredients to a large bowl. Add chicken to large bowl with the rest of the ingredients and mix until fully combined. Store in an airtight container and keep in the fridge for up to one week. If you are using avocados in place of mayonnaise, the fridge life will be shorter as avocados brown in the fridge. 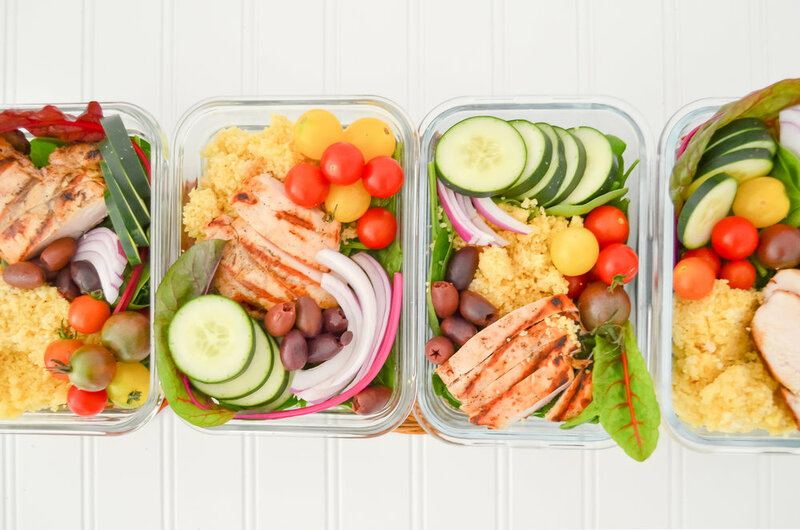 You can cut down the time to make this salad even faster by using rotisserie chicken instead of grilling chicken as well as purchase pre-shredded carrots instead of shredding by hand. I have recently noticed that Walmart does not carry the organic poultry and citrus seasoning anymore so I have used this brand instead. 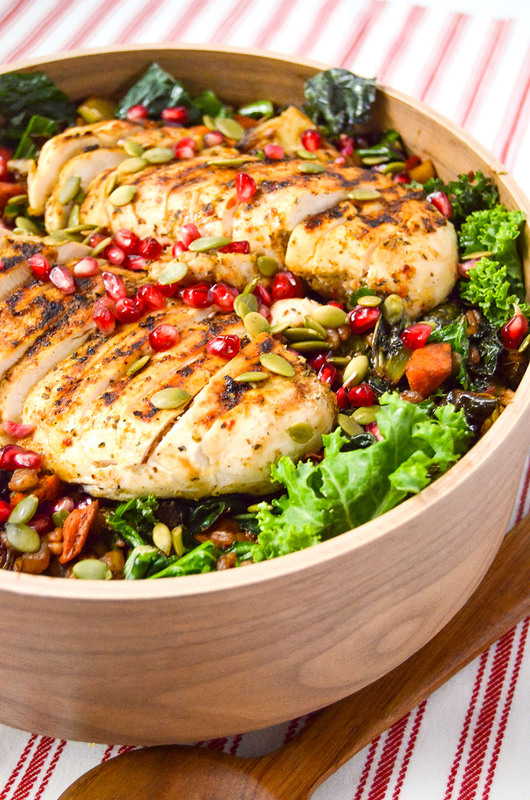 Classic grain bowl - Mediterranean style! Great recipe for batch cooking. Homemade goat cheese and olive dressing included! I don't know about you, but I generally have a busy schedule. An everyday schedule looks something like this: wake up at 6:15AM, get ready for work/prepare a smoothie, long commute to work, work all day, chemistry lecture in between, workout, come home, make dinner, study for GRE, work on homework, work on the blog, and go to bed around 11PM. As you can see, there is not much time in my schedule to make a nutritious and filling lunch. This is where batch cooking (or meal prep) comes into play! Mastering this art has saved me so much time and money. It has helped me to maintain a healthy weight by not eating out as much, especially at work. I typically batch cook on Sunday's for two hours. Within two hours I will make lunch for four servings, prep for breakfast meals that I want for that week, and chop fruits/vegetables for snacks and dinner sides. If you are just starting on the batch cooking train, grain bowls are the way to go! Not only are grain bowls easy to put together, they are also aesthetically pleasing. I love seeing all my veggies laid out on top! You begin by choosing a grain, a form of protein, some greens, and veggies, and finish it off with something extra like a dressing, lime wedges, or avocados. For this recipe, I decided to create a Mediterranean style grain bowl by using couscous, lemon and garlic marinated chicken, tomatoes, cucumbers, and mixed greens. I also created a goat cheese and olive dressing that is simple to make in a mason jar but is even easier if you have a food processor. Mediterranean cooking has become a popular way of eating as it consists mainly of fruits, vegetables, whole grains, legumes, and healthy fats with lean sources of protein like fish and poultry. This style of cooking is very easy to follow especially when it comes to batch cooking lunches. In this Mediterranean grain bowl recipe, you will need to cook the grain and protein but the rest is all fresh ingredients that are super easy to assemble. What’s even better about grain bowls is that you can add or take away ingredients if you need to! For example, if you want to skip the meat, you can instead toast chickpeas with 1 teaspoon of coconut oil and Italian seasoning in the oven at 425 degrees for about 20 minutes until brown and crispy. Let us know how you like to prepare your favorite grain bowl! If you tried this recipe, don’t forget to comment and share! Marinate chicken with minced garlic, juice, and zest of one lemon and S/P for at least 30 minutes. If you have more time, marinating it overnight will create a super juicy chicken! Grill or cook chicken in a skillet for 5-10 minutes per side until chicken reaches an internal temperature of 165 degrees Fahrenheit. While the chicken is cooking, add all dressing ingredients to processor and process until smooth and creamy. If you do not have a processor, finely mince garlic and olives and add to mason jar along with the rest of the ingredients and shake vigorously until desired creamy texture. This recipe will make four servings. With that in mind, divide up your couscous, chicken, veggies, and dressing in order to create four-grain bowls!